Internal or external, use one of two sets of easy-mount tabs or the included magnet. Also included is a mounting plate for duct support if needed or for adding a PCO module for upgrading to air stream purification. 6 tabs for easy external or internal mounting. Included versatile galvanized mounting plate. For ductboard and metal plenums. 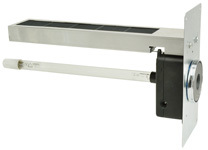 Included magnet attaches to the front of the UVC-Advantage for easy internal mounting. 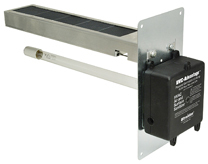 PCO purifier (if included) fastens to the mounting plate with 2 screws. Shown for external mount. ONLY FROM ULTRAVATION! UVC-Advantage is an amazingly versatile way to create an IAQ system in HVAC equipment. Starting with UV light for component disinfection, the UVC-Advantage Powered UV lamp module is a remarkable feat in compact design! It is sized so small that the lamp and power supply are integrated to form one unit. Installation could hardly be easier, but this is just the beginning. . . Beyond the simplicity of a one-piece UV light, at 3-1/2" x 4-1/8" x 1-5/8", it will fit just about anywhere. UVC-Advantage’s size allows mounting outside or inside the air conditioner using the inner or outer mounting tabs. Or, you can use the magnet mount. 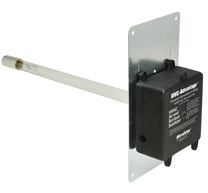 Or, if needed use the included mounting plate for secure installation on duct board. You get the idea. See installation flexibility photos at left. UVC-Advantage uses the same popular lamp lengths found in all Ultravation UV products. T3 Technology is a proven smart UV lamp system that thermally protects the lamp by encasing it in a UV transparent quartz glass sleeve. This allows the lamp to operate at an optimized temperature which results in maximized output of germicidal light—typically 40% more without any kind of power boosters that would use more electricity. With the UVC-Advantage—the only one-piece integrated UV light system—you can choose the 1-year Advantage with standard UV lamp for 9,000 hour life span before replacement is required. Or choose the 2-year Advantage with T3 lamp for 2X longer life span—18,000 hours and 40% more UV. Prevents the bio-film that insulates cooling coils and degrades cooling. With your HVAC system always running like-new efficiency, you will minimize your electricity costs. Keeps drain pans and drain lines clear of mold, fungus and bacteria. Allergy relief! Reduces or eliminates allergens generated inside the air conditioner. HVAC system biogrowth—even a film measuring a few thousandths of an inch—can cut HVAC efficiency by 40% to 50%. It can also become the source of high concentrations of allergens as the bio-growth emits spores. As the HVAC system distributes cooled air throughout your home is also distributes odors, airborne bacteria and viruses along with it.